Download teammates to a CRM friendly spreadsheet that you can easily upload to your CRM platform. 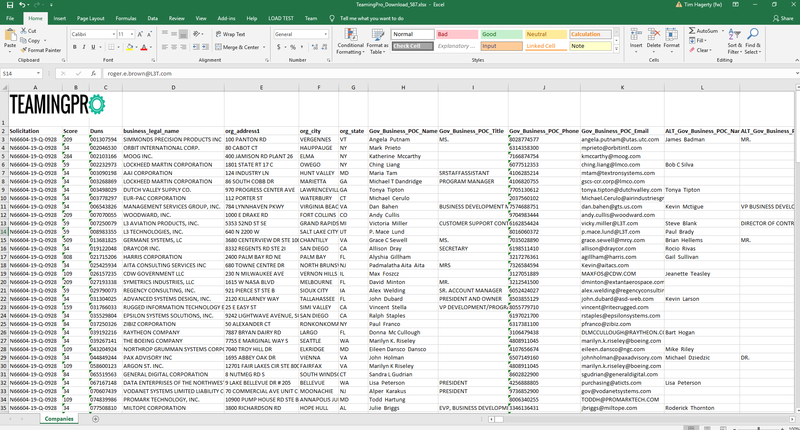 Our company spreadsheets are simple to download and full of useful information ready for your CRM. You’ll receive company info including set-asides, NAICS, location and other useful data not to mention all the contact information for the company itself. You can download companies associated with a solicitation, by company criteria, by past performance or IDIQ contract and easily segment the company contacts in your system. Now it’s easy to find relevant teammates, associate them with an opportunity, upload and track them within your CRM and always be on top of who you’re talking to and working with.